José Luis de Jesús Miranda is the founder and leader of Creciendo en Gracia sect (Growing In Grace International Ministry, Inc.), based in Miami, Florida. He claims to be both Jesus Christ returned and the Antichrist, and exhibits a "666" tattoo on his forearm (which is claimed is the number of wisdom). He claimed to transform himself & believers into living gods on June 30, 2012 and to rule the world. Update: Miranda died of a stroke on Nov 16,2013 and did not resurrect. Sergey Anatolyevitch Torop, also known as Vissarion, claims to be the second coming of Jesus Christ. A Siberian son of God, Vissarion certainly dresses the part, as evidenced by this photo, which may be why he's been able to attract over 10,000 followers. Known for both mass weddings and successfully merging business, religion and politics, Sun Myung Moon proclaimed himself the messiah and had a large congregation of followers in the Unification Church that supported his claim. He even declared himself and his wife "true parents of all humanity." These days we have no shortage in the number of people who claim they are Christ. In fact the above three are only the tip in the iceberg when it comes to this wave of false Christ. Would it surprise you if Jesus himself said in the end times there would be such people claiming to be him. For there shall arise false Christs and false prophets, and shall show great signs and wonders; insomuch that, if it were possible, they shall deceive the very elect. With all these false prophets, how can one keep themselves from being deceived and following one them? Notice that in verse 24 Jesus even says that they would be able to deceive the elect (true believers), if it were possible. How come only those elect are immune to the convincing of the signs and wonders? I contend the elect are able to not be deceived because they are familiar and know the true Christ Jesus way to well. It is they who compare the scriptural descriptions of Jesus with that of the ones claiming to be Jesus. Today when we deposit cash into our banks, especially with the larger denominations, the teller does various quick checks to ensure that the bill is genuine. Interestingly enough they aren’t told how to spot a fraudulent bill as there are way too many ways to have a fraudulent bill. Instead they are given the genuine bill and told to study it in detail. This way they know all the security features that are in a genuine bill that if missing tips them off to reject the bill. Likewise we need to study in detail the genuine Christ and how he is to come the second time, in order to recognize a fake Christ. Where do we find details of the genuine Christ? In the Bible and no other source. Christ came preaching from the Bible alone. Therefore anyone that claims they have additional books to the Bible or new revelations from God, or new visions from God, or a book held as an additional source of truth alongside or in place of the Bible (eg: Book of Mormon, Great Controversy, Watchtower, Septuagint) cannot be allowed. Most of these people claiming to be Christ have not acted like Christ, in that they are using their claims to amass great wealth from their followings. Jose Miranda is a multi-millionaire from people tripping over one another to donate property and money to him. He has several large houses and even a helicopter. Sun Moon is rich beyond belief, again from adherent’s donations. The real Jesus didn’t have anything to His name. But most importantly, I feel is we should find out how the Bible says he is to return the second time. After all, the Bible told everything that would precede his first coming, so we could identify Him. Interestingly enough his second coming is in both the Old and New Testament. 7 It will be a unique day, without daytime or nighttime-- a day known to the LORD. 10 …But Jerusalem will be raised up and remain in its place, from the Benjamin Gate to the site of the First Gate, to the Corner Gate, and from the Tower of Hananel to the royal winepresses. Currently this is a picture of the Eastern Gate rebuilt by Suleiman the Magnificent on the Temple Mount facing the Mount of Olives. 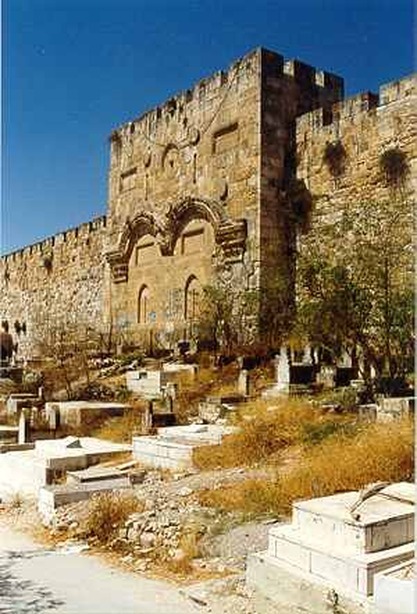 When Suleiman heard the prophecy he blocked up the gate and put a Muslim cemetery there to put something unholy in the way of the Jewish Messiah. Knowing that Jews could not walk over graves without becoming unclean. However, according to these verses an earthquake will completely change the topography of the area, raising the Temple Mount to become the highest location on Earth. 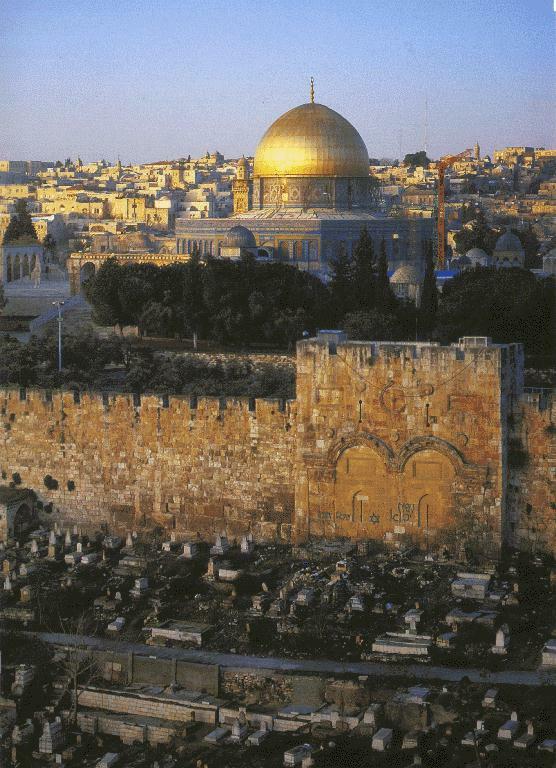 Interestingly, they recently found that the Mount of Olives is sitting on top of an active fault line. Simply put Jesus ascended to heaven from the Mount of Olives. When He comes back in the 2nd coming, Jesus will descend onto the Mount of Olives. 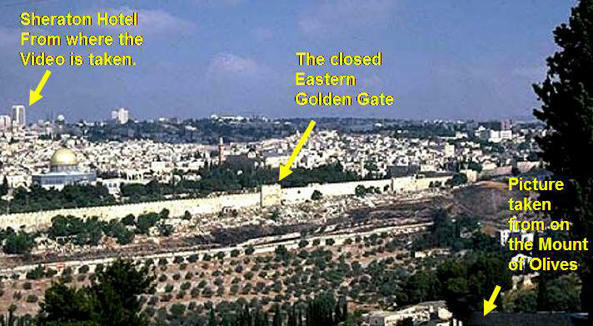 When His feet touch the Mount of Olives it will be rocked by a huge earthquake that will level the area and blow open the Eastern Gate which will then admit in the Messiah into the Temple Mount. But mind you this is the Second Coming where is to set up His millennial kingdom after Armegeddon. However you might ask what about Jesus coming for us in a Pre Tribulation Rapture? Can’t that be as quiet as all these false Christ claim to be? Let’s look at the verses describing the Rapture. Also if you look carefully in both of these verses you’ll see another awesome power of Jesus, as He was God himself. You will notice that both verses mention that real Jesus can and will raise the dead. This is one power no one can duplicate. Even the AntiChrist, for all his powers from Satan, can only take life, but never give it, much less give it back to something already dead. It is a power that is reserved only for God, as He is the only one that can bring LIFE. Here are a few examples in Jesus day. 14 Then Jesus said to them plainly, “Lazarus is dead. 3 His countenance was like lightning, and his clothing as white as snow. 4 And the guards shook for fear of him, and became like dead men. As can see the REAL Jesus can not only bring Himself back to life after 3 days, but bring people back to life after being dead for centuries. His power over death is absolute and can not be challenged by anyone, not even angels. Many people wonder how we can tell a Satan empowered fake Christ like the foretold AntiChrist from the geniune Jesus Christ?